It holds true that you cannot simply tell why your garage door panel is bent or broken - there are just various reasons involved. For instance, it could be due to an accident like backing out of the door and hitting its bottom part. It could also be due to daily wear and tear, causing the panels to deteriorate over time. But regardless of the reasons, know that your garage door is compromised, particularly its other parts. As such, you should not wait for the problem to get worst. You must immediately consider a professional and reliable garage door panel replacement in Maryland. When you encounter this situation, there is only one company to trust: Better Place Garage Doors. “Is garage door panel replacement really worth it?” “Should I even consider hiring a company to do so?” There is no doubt that these are just some of the many questions running in your mind. You might think that a faulty panel does not necessarily need fixing. Or perhaps it does, but you do not realize the importance involved. Imagine having two or more panels that are either damaged or worn. Don’t you think it wouldn’t compromise the security and safety of your property, belongings, and family, among many others? It absolutely does! So, as much as possible, you should never forget the benefit of hiring a professional garage door replacement company in Maryland. Mind you, though - the cost of replacing a number of panels does not necessarily have to be akin to that of a new door. 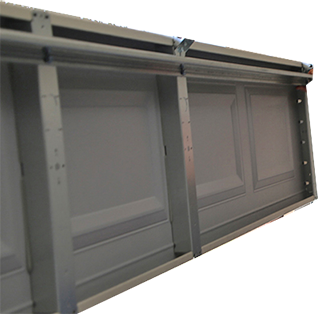 You will be surprised to know how valuable a complete garage door panel replacement is. As such, you will eventually understand why it is an ideal choice for this type of situation. At Better Place Garage Doors, all of our technicians are trained and certified to perform both replacements and repairs of your garage door panel in MD. Since your home is a precious asset, it only makes sense for you to give it the best of everything. And yes, the same thing can be said when it comes to garage door panel replacement and repair. Is Your Garage Door Panel Dented? We Got You Covered! Do you have a dented garage door panel? Well, if your answer is “Yes,” then do not think twice about getting it replaced. This is just one of the many reasons why must act upon it immediately. For starters, a dented panel means your garage door does not have the same appeal or beauty it has before. And since it is the very first thing that people get to see, you will likely to be affecting your property’s overall curb appeal. Remember that your garage door is one of the features that could easily be noticed about your home or office. If it has some broken or even dented panels, your garage door would absolutely look ugly. And if you keep it like that, your property’s appeal will eventually look bad. But the beauty of your home is not just the issue here - its security is also significantly affected. Instead of letting any of the aforementioned situations to happen, why not allow Better Place Garage Doors to provide with the best and most efficient garage door panel replacement. We have a team of experts who are ready to help you bring back your home’s curb appeal. More importantly, they will make sure that your property’s safety and security stays at an optimal level. Let’s say your garage door was recently jammed; hence, some of its panels are bent or dented. As a result, the door looks completely unpleasant. But since you are hesitant to make a move, you neglect the call for a reliable and expert garage door panel replacement in Maryland. The exterior of your garage door is often a common problem, particularly when its garage door panel is affected. After all, this is the part that you get to see when trying to close the door from the outside or when it is left open. But then again, a broken garage door panel in MD is not just about affecting the door’s beauty. Your garage door’s moving parts could also be highly affected. In most cases, they get damaged after the impact, which led to the panels getting broken or dented. At first, you would not really notice this. But as the time passes by, you will realize that your garage door is having trouble opening or closing. Regardless of how many parts are affected, it is safe to say that your garage door is not at its optimal working condition. This also means that it could not guarantee the safety of you and your family, let alone the valuable things kept inside your garage. You absolutely understand the magnitude of this problem, so do not wait things out and ask a professional help from Better Place Garage Doors. Better Place Garage Doors Is Here To Help! As always with any type of garage door problem, you should not try to fix the garage door panel. Instead of doing so, you must only rely to a professional garage door panel company. Note that your garage door comes with a variety of parts, all of which make up a complex mechanism. If you fail to put them together accordingly - or one of them are compromised - then the operation of your garage door is negatively affected. When you decide to work with Better Place Garage Doors, the cost of the project would not such be a worry. Our garage door panel services are cost-effective. Once we get your call, we will immediately deploy a team to perform an inspection in order to assist you with your situation. From there, they will assess everything and devise a solution. No matter the results, know that all of our solutions are designed to respect your budget, time, and space. Working with Better Place Garage Doors brings your genuine happiness and satisfaction!